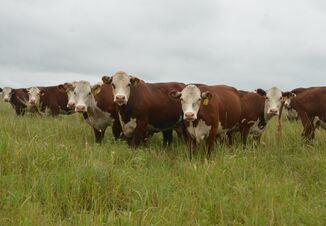 Since it was first identified as a cause of abortion in cattle in the early 1990’s, Neospora caninum has become a commonly diagnosed problem worldwide. In addition to abortion, N. caninum can also cause stillbirths and convulsions in newborn calves. This organism is the most often diagnosed cause of abortion in dry lot dairies in the west and occurs sporadically nation wide in beef and dairy herds. There is no treatment for this problem, but testing and culling infected animals along with the use of a vaccine can reduce abortion losses. Neopora caninum is protozoa whose natural host is dogs and wild canids, such as coyotes. Infection occurs when cattle inadvertently consume feces from these canids. Once cows in a herd become infected, they pass the infection along to their calves while the calf is still in the cow’s uterus. While abortion may occur, the majority of infected calves are normal at birth, However, 80% of calves born of infected cows are themselves infected and infected females kept as replacements are more likely to abort and/ or give birth to infected calves. This passing along of the infection from cow to calf is the most common way the disease remains in the herd. Infected cattle are considered infected for life though their risk of abortion decreases with each calving. However, their risk of aborting remains higher than cows which do not have the infection. Heifers are more likely to abort than cows. The most common clinical sign of N. caninum infection is abortion. Usually, 5 to 10% of the herd will abort within a 2 month period of time, though higher rates of abortion have been noted. Abortions may occur at any point in pregnancy but are most common from 3 to 8 ½ months. Stillborn calves and weak or paralyzed calves that may have convulsions are also seen. 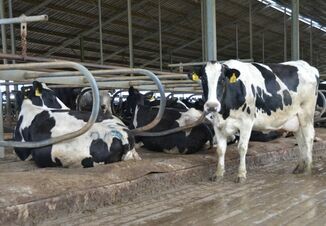 Lower milk production in aborted cows and low birth weight calves can occur. A vaccine is available (Neoguard® Intervet) with a label claim as an “aid in the reduction of abortion due to Neospora caninum”. Label directions require that the vaccine be given during the first 3 months of pregnancy with a booster 3 to 4 weeks later and annual revaccination. 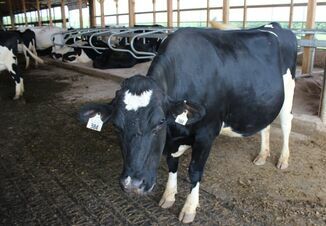 The vaccine is not useful in cows that are already infected but seems to help prevent new infections in uninfected cows. Diagnosis of this problem requires help from a diagnostic lab. Blood tests are available and culling of positive cows should be a part of the control program. Recommendations are to test heifer calves at weaning and avoid retaining positive heifers as replacements. If a cow does abort, submitting the fetus and placenta is helpful for making a positive diagnosis. To the degree possible, do not allow dogs access to feed sources such as hay, silage, balage, or grain. Any aborted or stillborn calves and the afterbirth should be disposed of in a way that cattle and dogs will not have contact to them. Neospora can be a frustrating and costly disease. Management includes testing/culling, proper vaccination, and restricted access of canids to feed sources. If you have any questions, please contact your local veterinarian, Extension agent, or myself at, lstrick5@utk.edu, 865-974-3538.